The KNAUER FPLC systems AZURA Bio LC are extremely flexible, adaptable and reliable. Due to their biocompatible design, the AZURA Bio LC systems are suitable for any protein purification or biochromatographic challenge. The standard configuration can be modified or supplemented at any time by optional components. 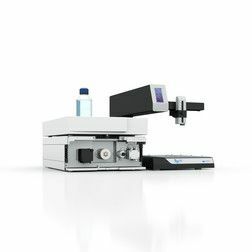 Versatile functionalities such as column switching, buffer and sample selection as well as fraction collection enable you to automate the purification. Whether simple or complex, configure your AZURA Bio LC system according to the requirements of your purification.